Jack is a sheep farmer. He gets some government subsidies, and also works long hours to keep his sheep happy and healthy. When his beasts are ready for slaughter, he offers them to an abattoir. 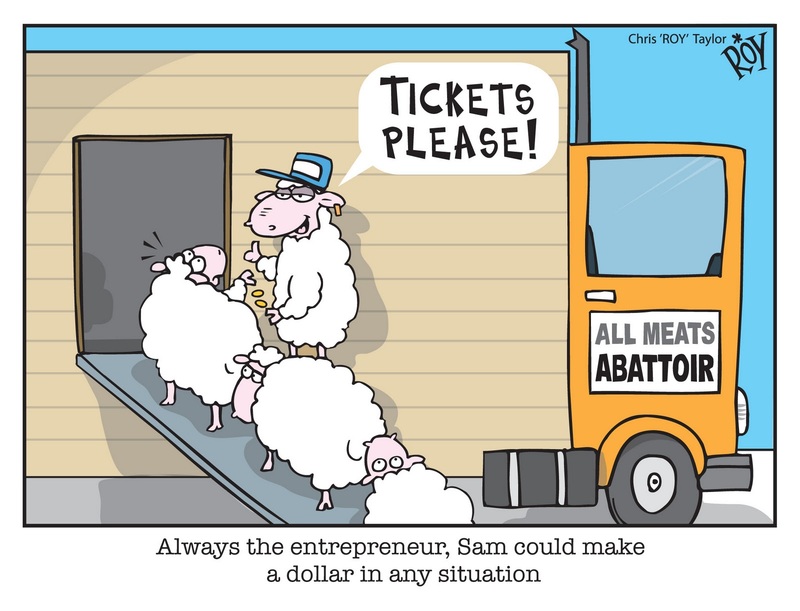 The abattoir is very choosy and may reject Jack’s sheep, which is a disaster for him, as there is no other route to the market. 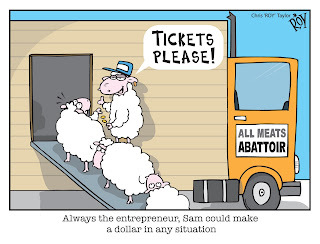 If he is lucky the abattoir will accept the animals, slaughter them and sell them, at a large profit, to the supermarket. Jack does not see any of this money. The populace struggle to afford the price of meat, but the government has no control over this. When Jack feels like a nice piece of lamb, he buys it from the supermarket. Meanwhile, Jack provides his services for free as an inspector of other farmers’ animals. Crazy story, right? But that’s the model that academic publishing follows. Academics work their butts off to get research funding, often from government. They then do the research and write up and submit it for publication. They run the gauntlet of picky reviewers and editors to get the work accepted for publication. Once it is published, it appears in a journal which is sold on to academic institutions for large profits. Post publication, the academic often has to pay a cost equivalent to several hardback books to get a formatted electronic copy of the article. Meanwhile, the journals justify this by arguing they have extensive costs. But in fact, it is the academic community that does the bulk of the work for free, acting as editors and peer reviewers. Increasingly, they are expected also to do copy editing and graphic design, tasks that were previously undertaken by professional journal staff. It has taken many years for the torpid academic community to wake up to this ludicrous situation, but things are slowly starting to change. In some fields, academics are starting to take things into their own hands and cut commercial publishers out of the loop, but this still the exception rather than the rule. A more widely adopted innovation has been Open Access publishing. On the one hand, electronic publishing has made it possible for journal papers to be posted online and made freely accessible. On the other, major funders, notably NIH in the USA and the Wellcome Trust in the UK, have insisted that researchers whom they fund must make their published work Open Access. Obviously, something has to give: the publishers are not going to do their work for nothing. But the system does work, with a combination of new journals that are Open Access from the start, and older ones agreeing to make selected articles Open Access, in both cases for a fee. In general, the funders agree to pay the charge. This week, however, a story broke suggesting that the traditional publishers are trying to fight back and force NIH to backtrack on its Open Access policy. Things hotted up with this post from Michael Eisen who noted that one major publisher, Elsevier, has been lobbying a NY Congresswoman, Carolyn Maloney, to persuade her to support a bill that would limit Open Access publishing. Harvard University gave a detailed response to the bill, which can be found here. I want my response to this story to go beyond just tut-tutting and shaking my head. Academics do have some power here. We provide the articles for Elsevier journals, and we do a lot of unpaid work reviewing and editing for them. None of us wants to restrict our opportunities for publishing, but these days there are a lot of outlets available. When deciding where to submit a paper, I suspect that most academics, like me, take little notice of who the publisher of a journal is. I focus more on whether the journal has a good editor, my prior experience of publication lags, and whether Open Access is available. But as from now, I shall include publisher in the criteria I adopt, and avoid Elsevier as far as I can. Also, if asked to review for a journal, I’ll check if it is in the Elsevier stable, using this handy website, and if so, I’ll explain why I’m not prepared to review. I suggest that if you are as annoyed as I am by this story, you do likewise, and refuse to engage with Elsevier journals. Some people on Twitter have asked if people should be paid for the work they do as author/editor/reviewer. Definitely not. It would just make matters worse, because publishers would factor in these costs and charge even more for journals. No, I just want a change in the model whereby publishers make enormous and undeserved profits from academics. There are various ways this could be done. 1. The publishers could charge less: currently if you try and download a single journal article, you are charged around £20, even though the production costs are minimal. 2. Retain the current model but remove commercial publishers from the loop, with publication of research limited to learned societies, universities, funders. 3. Retain the current model but make all journals Open Access, with the funder or university paying a one-off publication fee. 4. More radically, move to a system such as arxiv, which I discussed here. On the whole, academics are an interesting bunch. We’re not all that interested in money, but we are skilled and can produce things of commercial value. It’s a golden opportunity for someone who does want to make money to step in a make a profit. Publishers like Elsevier would have been fine if they hadn’t been so greedy and had charged modest sums for their product. Instead, they pushed costs as high as the market could bear, making huge profits, while at the same time giving authors less and less. (Copy-editors have become an endangered species). Instead of facilitating scientific communication, they have put obstacles in the way. But part of the blame lies with the academic community, who have been far too passive. We should have tackled this years ago before it got out of hand. I can't remember where I saw it (Cameron Neylon's blog?) - but I believe there is a movement to encourage scientists only to offer peer review for papers that will be open access. I'm sympathetic to this and Elsevier's self-serving behaviour is a further spur to triage publishers before accepting peer review requests. It was a lot simpler in the days before the internet and online submission. I had an interest in autism research before my daughter lost her diagnosis. I submitted several critical reiews of original research publish in the Journal of Autism and Developmental Disorders. I mailed the submission directly to the editor, Eric Schopler. Not only would he call me, in one case he rewrote the entire critique in a more straightforward and made the paper much more understandable for the readers of the JADD. The enire process would take no more than a few weeks and I never had a submission rejected. I have also found that if you email the author of a paper that does not have open access requesting a reprint I have always received a PDF of the full text article. I would certainly agree that reviewers ought to be paid and that the Journals should offer low subscription rates for members of the general public who may be interested in a specifc topic. responsive to author needs in the STM publishing industry. Many thanks for all comments. I've added an addendum to the post to clarify my views on payments to reviewers etc. Elsevier have introduced these policies in response to pressure from the Open Access movement. I have no expertise in marketing but I suspect it works like this. In general, they know that allowing authors to distribute work via email/talks/etc won’t have much impact on their profits because the numbers of people who get the paper via this route will be small. I suspect that a bigger danger to publishers are free depositories of pre-prints in university archives, which potentially can be accessed by anyone. At the moment these don’t have much effect on profits because few people know about them, but this could change if universities were more effective in promoting them. But if this takes off and starts affecting their profits via regular subscriptions and one-off sales, what will publishers do? Put the price up, of course! I’ve added an addendum to the post, with a link to a site that focuses on levels of profit in this industry. The thing about a cash cow is that once you have it, you’ll do anything to maintain it. (2) would be a good start; but (3) should be a minimum, to enable public access to academic knowledge. (3) should be achievable, because institutions could use money otherwise given to journals (but managing the transition would be hellish). (4) could be great (and I assume it works or it wouldn't have evolved and survived; but I don't know anything about the disciplines that use it). You're right. A great deal more needs to be done to promote repositories, and showcase new research output. Nos 21 to 29 in my post http://roddymacleod.wordpress.com/2011/11/10/where-to-find-new-scholarly-research-papers-30-key-free-websites/ Where to find new scholarly research papers: 30 key, free websites, covers IR content. These are not enough, and it is not easy enough to browse new research output. ... Whereas I have no problems with refusing to review papers, which I've outlined here: http://www.timeshighereducation.co.uk/story.asp?sectioncode=26&storycode=417576&c=1. I agree with refusing to review, and have already done it. But I am unsure what to do with society journals which are published by commercial publishers. I wish to support society journals, and would not want to stop helping, for example, J Evol Biol (of the European society for evol boil ESEB), although they are published by Wiley, and are classified Yellow (i.e., not very open) by Sherpa/romeo. There are many journals in a similar situation in my field. I've also agonised over what to do about society journals -- in my case, the relevant ones are the Journal of Vertebrate Palaeontology (journal of the Society of Vertebrate Paleontology, published by Taylor-Francis) and Palaeontology (journal of the Palaeontological Association, published by Blackwell). I am gradually coming to the reluctant conclusion that they shouldn't be given a free pass for their non-openness just because they are affiliated with societies. In the end, the societies are there to serve the interests of their members, not vice versa. And by letting their journals be published as non-open by commercial publishers, the societies are not working in my interests, nor those of other scientists -- neither members nor non-members. For now my position is to lobby colleagues so that we slowly move our society journals to Green OA publishers. I see a boycott as effective in this case once there is already a strong trend, to push the undecided. Similarly, I signed the original PLoS letter, but frankly we didn't yet have much choice. By the way, the distinction commercial / non commercial is tricky. BMC is commercial. Amercian chemical society is non commercial, yet is a big opponent of OA. We have a 3-way grid of OA/close, commercial/not, society/not, and of course you need to take into account such details as scientific relevance. I see commercial / not commercial as a minor criterion, relative to the importance of scientific societies and of OA. You're right, of course, that the correlation between open=non-commercial, closed=commercial, while strong, is nowhere near 1.0. Sorry for my sloppiness above. For what it's worth, I prefer non-profit publishers, because then I know that any money I spend on OA fees is going to infrastructure and other support, rather than to shareholders. But, yes, it's a much less important axis than open/closed. You can find others who have pledged to redirect efforts towards OA at openaccesspledge.com and researchwithoutwalls.org. Such lists help show the size of the movement and give us more clout. I was just about to consult with others about redoing the openacesspledge site to accommodate fully customized pledges, possibly including a checklist of options as it seems everyone has their own idea of what's most important and feasible to pledge. We need help with formulating the checklist options, general advice, and website programming. Drop me a line if you're willing. Could publishing be simply by blog/wiki posts + links to data. Editors simply people who aggregate articles (using RSS) and provide feedback (via comments and ratings). As you are doing here academics could be constantly improving their piece. Once ratings and comments are settled to an adequate standard the piece could be archived with a University library service. This truly open approach to publishing (where drafts are openly available) would have the advantage that many more people could contribute - even non-academics. I appreciate this does pose a small online design issue for handling large volumes of comments but that is tractable (see Slashdot) and a nice problem to have. Open access is a big issue for non-affiliated scholars who may not have access to university resources. It is also as important an issue for Arts and Humanities reasearch as for science and social sciences. I think it is high time that academics do become interested in being properly paid for their expertise. As far as I am concerned, part of the reason there is the problem of unpaid labour in the academy is due to some sort of academic koolaide that leads many to conflate the notion of a "vocation" and "fair labour conditions." As an academic, I would like to strike a balance between optimum exposure of my work to the world at large as a work that serves the public interest and appropriate financial recognition of my labour and expertise. So the claim that academics are "not that interested in money" is really an indictment of academic stupidity, stupidity that has to go. The article has actually peaks my interest. After reading your article Love your work, clear! I admire your talent, hope to see you again next time of the works, I wish you good luck! Studying this info So i am satisfied to exhibit, Love your work, clear! Most academics I meet in publishing are really after something for nothing, and there are a number of reasons for this. First of all, they are not sufficiently skilled to get mainstream publishing deals, and, second they are desperate to get published at any cost. If I would add a third, it's that they just don't grasp the concept of attaching commercial value to their work. I find it quite amusing, actually. Don't blame the commercial publishers for trying to make a buck/quid off academics ... they've got the winning lottery ticket! Will I still be tweeting in 2013?